Prost Grand Prix was a Formula One racing team owned and managed by former world champion Alain Prost. The team participated in five seasons from 1997 to 2001. Alain Prost completed the purchase of the Ligier team in early 1997, and immediately changed the name to Prost. 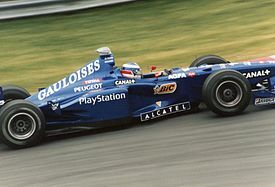 An exclusive contract for Peugeot engines was announced for 1998, but the team continued with Ligier's planned Mugen-Honda engines for 1997. As there was no time before the season started to design and build a new car, the team simply used the Ligier JS45 designed by Loïc Bigois and renamed it the Prost JS45. Podium finishes in Brazil (third) and Spain (second) for Olivier Panis promised much, but the Frenchman crashed heavily at high speed in Canada, breaking both his legs. With its lead driver forced to miss much of the season, Prost struggled with novices Jarno Trulli and Shinji Nakano until Panis's return at the Luxembourg Grand Prix. There were glimpses, a commanding drive by Trulli in Austria where he led for much of the race before his engine expired, and a run by Trulli again to fourth at Germany showed potential, and a dogged points finish for Panis on his return in Luxembourg meant that Prost wasted no time in signing the pair up for a further season. 1997 world champion Jacques Villeneuve later remarked that in the year of his title victory, he had regarded Panis as something of a threat. Panis had been fastest in Spain, and was running right behind Villeneuve in Argentina when his car gave up on him. He was close to winning in Canada too as his Bridgestone tyres were better equipped than the Goodyear tyred cars around him. After such a promising 1997, things took a turn for the worse in the following seasons. After serious gearbox problems in testing, the team almost did not start the 1998 season-opener as their car still had to pass a crash-test. They made it to the Australian Grand Prix, but the season proved to be a failure. Only Trulli's sixth at Spa kept the team from last in the standings. 1999 saw an improvement, several points finishes achieved and a second place coming by way of Trulli's strong drive at the Nürburgring. In the first few races, the team also ran with X-wings. At times the car looked genuinely competitive with strong qualifying displays. Yet the results often failed to materialise. At Magny-Cours Panis had started third, but was unable to capitalise and finished outside the points. Trulli was under contract for 2000, but the team's relative lack of success enabled him to leave for Jordan. Panis was dropped and went on to become McLaren's tester. In 2000 the team began its sharp decline. Veteran racer Jean Alesi, Prost's former teammate at Ferrari in 1991, was signed to the team. The team also signed up rookie F3000 champion Nick Heidfeld for 2000. Despite a promising driver lineup, Prost finished last in the Constructors Championship, failing to score a single point during the season. Heidfeld was disqualified from the European Grand Prix at the Nürburgring for his car being two kilos underweight. At the Austrian Grand Prix their two drivers crashed into each other, putting them both out of the race. The relationship between Prost and Peugeot collapsed. Jean Alesi driving for Prost during 2001. In 2001 the cars now ran with Acer-badged Ferrari engines. The season began with Alesi and ex-Minardi driver Gastón Mazzacane, but after four races, the latter was dropped from the team and replaced by Jaguar's Luciano Burti, who himself was replaced at Jaguar by Pedro de la Rosa. Alesi was very consistent, finishing every race, occasionally in points scoring positions, most notably in Canada when he did a few donuts afterwards and after getting out of the car, threw his helmet into the crowd. It was his best finish with the team. A fallout after the British Grand Prix, however, saw Alesi walk out after the German Grand Prix. For his final race with Prost, Alesi scored another championship point in that race of attrition. The first start for the race was red-flagged when Burti was launched into the air after crashing at high speed into the back of Michael Schumacher's ailing Ferrari just seconds off the line. Alesi moved to Jordan Grand Prix for the rest of the year, and was replaced at Prost by Heinz-Harald Frentzen, who himself had been sacked from Jordan after Silverstone. In Belgium, Frentzen qualified a surprising fourth on the grid after getting his first and only dry lap right in drying conditions, but threw it away when he stalled on the initial formation lap, the first of three red flags. The third one saw a long delay after a huge crash at the fastest part of the circuit involving Burti and Eddie Irvine's Jaguar. Burti was transported away from the circuit by helicopter and taken away for medical observation. At Monza, F3000 driver Tomáš Enge became the fifth driver to drive for the team in 2001. There would be no more points that year. At the end of the season, speculation began surrounding the fate of the team in the light of its increasing debts. Finally, in early 2002 the team went bankrupt, just before the start of the season. Prost had been unable to raise enough sponsorship to keep the team afloat. Deeply hurt by the episode, Prost described it as a disaster for France. Frentzen had hoped to stay, but ended up at Arrows. The team never managed to replace the money that Gauloises stopped supplying when they withdrew their title sponsorship at the end of 2000. A consortium fronted by Phoenix Finance – run by Charles Nickerson, a friend of Arrows' Tom Walkinshaw – purchased the team's assets, believing that together with their purchase of old Arrows assets, specifically the engines, it would gain them entrance for the 2003 season. However, the FIA viewed the consortium as a new entry (subject to an entry fee) and the project did not go ahead. Wikimedia Commons has media related to Prost Grand Prix. This page was last edited on 4 February 2019, at 16:51 (UTC).